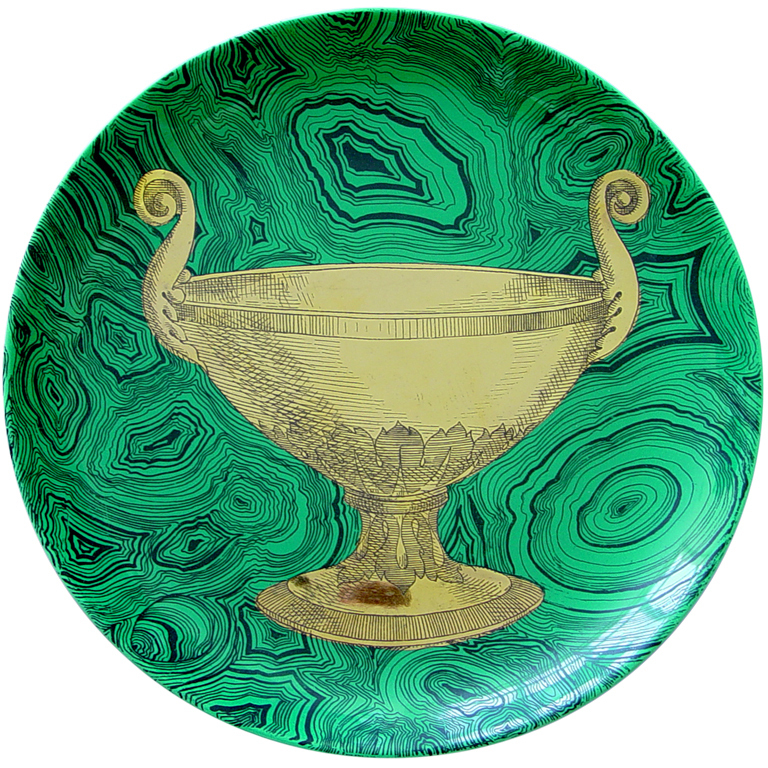 vintage Fornasetti malachite plates at First Dibs. 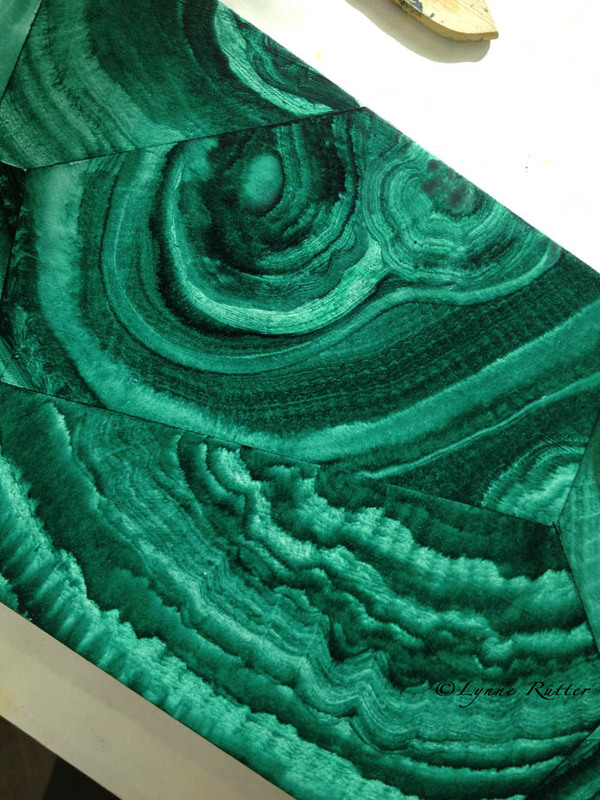 One of my long-time obsessions is malachite. 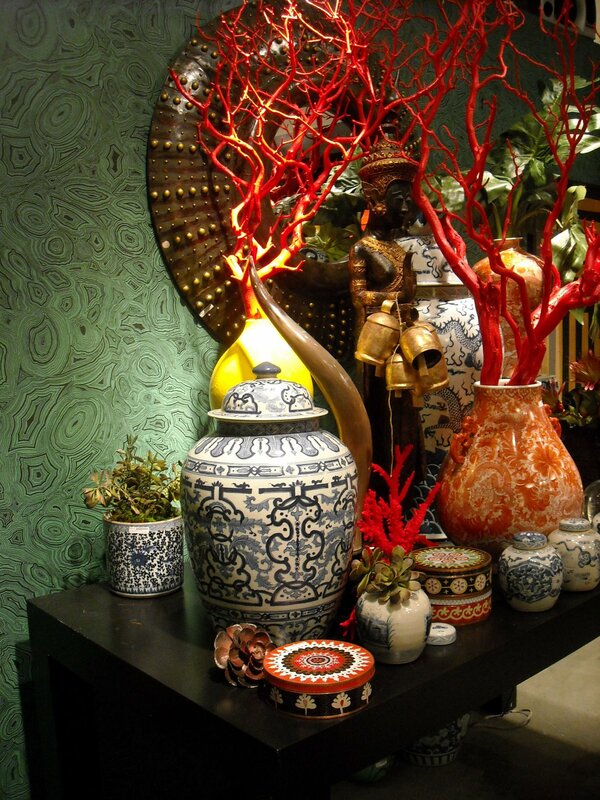 Not just the stone, but as a motif in interior design. I love the vibrant color, the mesmerizing pattern, and the way it just seems to look fabulous no matter where you use it. I am also a bit crazy for Fornasetti, whose gold and malachite plates (above) mix Empire splendor with Mid-Century chic. 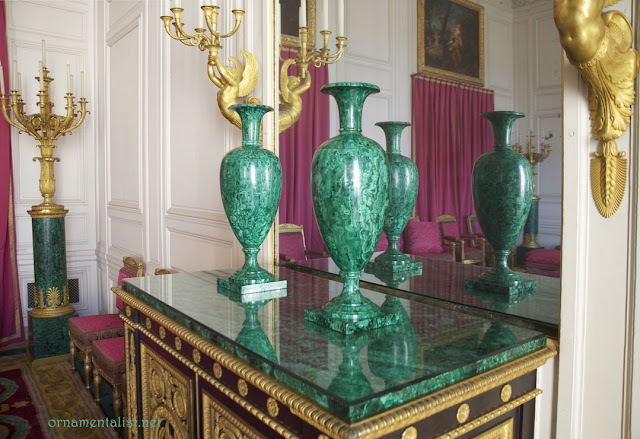 Malachite as both a pattern and a color works wonderfully into period as well as contemporary interiors. Napoleon lived for a time in the Grand Trianon at Versailles, and decorated its interior in Empire style. Le Salon des Malachites showcases a collection of furnishings using the semi-precious stone, set off by deep rose pink upholstery. A generous amount of ormolu trim never hurts (and makes for a nice color triad). Pillows made from "Gemstone" fabric in Emerald, from the Tony Duquette collection for Jim Thompson. Tony Duquette was famous for using malachite as part of his eclectic and colorful interior design. 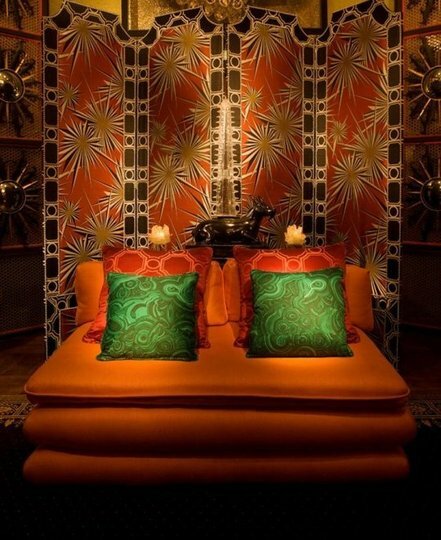 Above, the addition of malachite pillows brings a vibrant complementary punch to the analogous palette of the space. The same fabric used in a black or red Chinoiserie scheme? Oh yes! Coral-colored branches and Chinese porcelain with Fornasetti Malachite wallpaper form Cole and Sons, England. 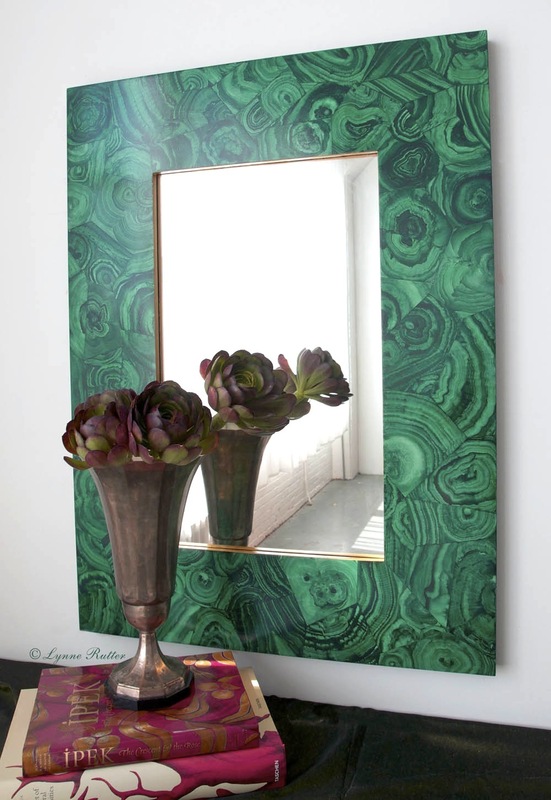 Cole and Sons makes a wonderful Fornasetti Malachite wallpaper and you can also find a well-designed malachite fabric by Ravynka at Spoonflower. Pantone's Color of the Year for 2013 is Emerald Green. I can think of no better way to incorporate this color into your life than with malachite. Although, real emeralds are totally acceptable, of course. For my fellow painters and color enthusiasts, genuine Malachite pigment is available from Sinopia. I recently painted a large faux malachite mirror frame with 22 karat gilt edge, which is now available for sale at $2,300. Contact me if you'd like this piece, or to commission one like it! Malachite! I had no idea SInopia had the pigment....hmmmmmm...must add to my collection. Beautiful mirror, your work has class. I love the minor too.